Yabo Tenmangu Shrine (谷保天満宮の梅) is one of the Japanese Plum spots located in Kunitachi, Tokyo. 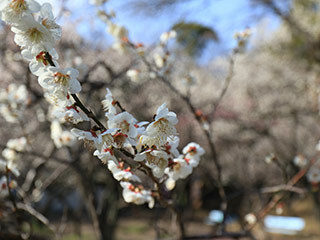 There are about 350 plum trees that bloom in early March. During the season, there is a Ume festival. Period: From the middle of February to early March. 2. change to JR Nambu Line to Yabo Station. Yabo Tenman Shrine is one of the oldest Tenman Shrine in eastern Japan. It is also known as great plum garden.